VST Plugins are tools for working with audio. They are either instruments or effects, in other words they either make sounds, or modify sounds. (There are other possibilities like a recording or analysis plugin.) A VST host is needed to use them. Any program, including audio recording and editing programs, that supports VST Plugins can be considered a VST host. How do I use guitar effects in real time? Consult the documentation for the VST host program you are using for this. IT will probably start with adding an effect to a track. Then arm the track for recording, and also for direct monitoring. If you don't have a host you may want to try a program called VST Host for this. Your goal is probably to get the best latency your device can handle without pops, stuttering, etc. It's often a frustrating process. The suggested method is to start by setting your sound device input and output to asio type in your program's preferences and working down to lower buffer settings until you can't go lower without problems. If that doesn't work try it with settings other than asio. If you can't get asio for your system you may look into trying asio4all as a last resort. Click the Amplifier tab if you are not already there, then click the menu that says Presets and select Save As New. Only Choose save if you are absolutely sure you want to overwrite the current preset. How do I arrange presets? You can rearrange presets by clicking Show Presets, clicking the right corner of a preset, and dragging. That also works for categories. 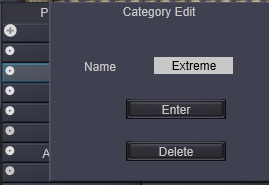 You can move the preset to a new category by dragging too. Can I rename a category? Can I delete a category? Can I add one? There is circular icon next to categories that can do that. The + icon on "Show All" is for adding a new category. What does the Open IR Folder command do? To do this, click the menu Cab Sim, click Open IR Folder, browse to the folder with ir files in it, and click Select Folder. All the IR files in that folder will now be in a new category in the change cab dialog. How do I disable the noise gate for everything? Click the options tab, set Global Gate Settings to on, then turn the Noise Gate: Threshold knob all the way down, it is now off. Can I disable cab sims for everything too? Yes, Disable Cab Sims in in the Options Tab. What is Antialiasing / Oversampling? In this plugin they are the same and the term Antialiasing is used. For now don't worry about what it is, just remember that at higher amounts you get better quality, especially for high pitches, but at the cost of processor usage. So at 44.1khz sample rate 2X is OK, 4x is good, and 6x or 8x is great but costly. At 96khz you can get the same results with half the value, so use 2 to 4, definitely overkill to use higher at high sample rates. For cab sims, what does Dry do? What is Invert? Dry mixes in a little pre Cab Sim signal to the mix, often adding some high frequency, though it can be hard to tell if the volume of the sim is high. This usually doesn't sound good with guitar, but it's worth experimenting with. Invert probably won't make a noticeable sound difference with basic setups but it can be useful when trying to mix 2 guitar sounds or impulses to prevent cancellation, so just try it if you are having problems. I tried a pedal in "Pre" and "Post" but it sounds about the same, why? It can take some experience to understand the pros and cons of putting pedals, amps, etc. in a particular order, and they may just sound the same sometimes. Just remember that post means it is after the amp, which can be too muddy for an overdrive or too hectic for a compressor but perfect for delay. Auto Wah especially sounds different pre and post overdrive. Even if I turn the treble knob down, why do a lot of presets seem so bright? Partly because that is simply how vintage tube amps are, they are voiced bright perhaps assuming you need to recover high frequencies lost by various factors, a big one being volume and tone knobs. So if it seems like the Amp Sim is making your guitar sound too bright try lowering the guitar's tone and volume knobs a little. Modern pickups can also be very bright and you may want to use the internal EQ effects in pre mode to fine tune it. Can I re-initialize and go back to the original presets? If the Amp Vision plugin cannot find the amp-vision-save file in the same folder it will re-initialize. Also, you can keep copies of your old save file and such as a back up, it's a fairly easy to use system. Why is it that amp-vision-save.fxda doesn't appear in the same folder as amp-vision.dll? This can happen on Windows 7 or 8. It appears that the save file still works but is in a Virtual Store, try searching the whole drive for the filename. I Purchased a product but how do I get it? Please consult this page in full first SUPPORT: INSTALL. Also keep in mind you cannot change our demo programs into the full version, you need to download a full version file and replace the demo. If you are still having trouble please describe everything you are doing and having trouble with and include your user name and full name when contacting us on our contact page. I have used up all my allotted downloads for something I purchased, what do I do? Please let us know and include your user name and full name when contacting us on our contact page.